Sidney junior pitcher Trey Werntz throws during a Greater Western Ohio Conference American North Division game on Monday in Piqua. Sidney freshman EJ Davis dives back to first base during a Greater Western Ohio Conference American North Division game on Monday in Piqua. PIQUA — Sidney had trouble with a streaking Piqua team in a Greater Western Ohio Conference American North Division game on Monday at Hardman Field. The Indians jumped out to a seven-run lead in the opening inning and went on to a 12-1 win. It’s the fourth consecutive win for Piqua, which improves to 6-5 overall and 4-3 in GWOC American play. The Yellow Jackets dropped to 4-8 overall and 2-6 in GWOC American play. The first three runs came before Piqua had a hit. Piqua pitcher Owen Toopes started things with a walk. Zack Lavey put down a bunt and was safe on a throwing error. Mick Karn reached on a fielder’s choice, scoring Toopes. Karn scored when Zane Beougher reached on an error and Iverson Ventura’s sacrifice fly scored Beougher. Cameron Deal walked and Ethan Pohlschneider singled. Dylan Motter looped a two-run single into right field. After Blane Ouhl walked and Toopes was hit by a pitch, Lavey had a two-run single up the middle to make it 7-0. Karn walked, stole second and scored on Beougher’s RBI single. Beougher would eventually score on a wild pitch. Ouhl lined a ball into right field for a single and went to second when the ball got past the right fielder, with two runs scoring on the play. Toopes had a fielder’s choice capping Piqua’s scoring. In the second inning, Karn fielded a slow roller at third base and went airborne to throw the runner out, while Deal chased down a long fly ball in the top of the fifth in leftfield. Russia senior left-hander Daniel Kearns pitched a perfect game to lead the squad to a Shelby County Athletic League victory on Monday in Houston. Freshman outfielder Aiden Shappie had a diving catch in right field on the last play of the game to preserve the perfect game. Kearns had 11 strikeouts and got through seven innings on 74 pitches. The victory was the 19th of his career, which ties the school’s record. Russia had seven hits and no errors while Houston had one error. Carter Francis was 2 for 4 at the plate with 1 RBI. He hit one double, as did Will Sherman and Kearns. Howie Ludwig was charged with the loss for Houston. He gave up four earn runs on five hits and four walks in five innings. He had five strikeouts. The Redskins cruised to an SCAL victory in five innings on Monday in Fort Loramie. Devin Wehrman hit a triple with the bases loaded in a big first inning to get the game rolling. Aidan Reichert hit a line-drive single to left field in the bottom of the seventh inning to bring home one run and lift the Tigers to an SCAL win Monday in Jackson Center. Jackson Center had six hits and no errors while Fairlawn had three hits and two errors. 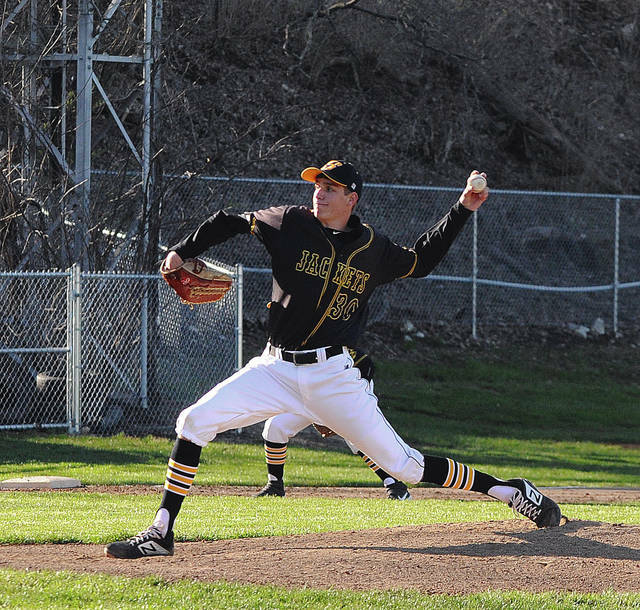 Jacob Francis earned the win for the Tigers. He pitched six innings and allowed one earned run on two hits and five walks. He had 11 strikeouts. Francis was 2 for 4 at the plate, with both his hits being doubles. Reichert was also 2 for 4 at the plate. Doug Wright was charged with the loss for Fairlawn. He pitched a complete game and gave up two earned runs. He had seven strikeouts and three walks. Keith Orndorff had a double for the Jets. After a slow start, Lehman scored seven runs in the third inning to jumpstart a five-inning Northwest Central Conference victory on Monday at Hardin Northern. Lehman had 18 hits and two errors while Hardin Northern had three hits and two errors. Ethan Potts pitched a complete game. He gave up three hits and had five strikeouts. RJ Bertini was 4 for 4 for Lehman with 3 RBIs. He hit one double. Drew Barhorst was 4 for 4 and had 2 RBIs and three runs. Mitchell Sollmann, Alex Keller and Jacob Trent each had two hits. Sollmann hit a home run while Jared Magoteaux and Trent each hit a double. The Cardinals scored 12 runs in the first two innings to set the tone early in a run-rule nonconference win on Monday in New Bremen. They had 14 hits and two errors while Covington had five hits and four errors. Mitchell Hays was 3 for 4 with 2 RBIs. Zach Bertke and Patrick Wells each had two hits. Hays, Justin Tenkman and Bryce Blickle each had one double. Bertke scored four runs. Nick Wells picked up the win on the mound. He allowed two hits in three innings and had one strikeout and two walks. 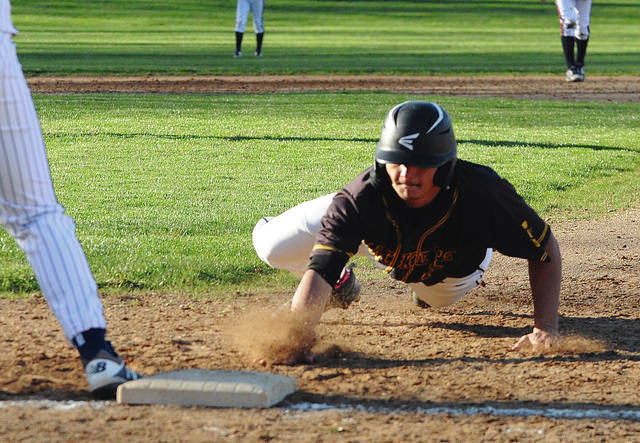 Piqua scored four runs in the first inning and cruised from there to hand the Yellow Jackets a Greater Western Ohio Conference American North Division loss on Monday in Sidney. Hallie Westerbeck was 3 for 4 for Sidney. She hit a home run and scored two total runs in the game. Jenna Smith was 2 for 4 and Alli Milanese was 2 for 3. Milanese had a double, as did Allie Herrick. Lauren Barker was charged with the loss in the circle. She had six strikeouts and three walks. The Redskins scored one run in the bottom of the fifth inning to end a run-rule victory on Monday in Fort Loramie. They had 13 hits and no errors while Botkins had three hits and two errors. Cassidy Albers was 3 for 3 with 2 RBIs for Fort Loramie while Aleah Frilling, Desiree’ Fogt and Ellie Holthaus each had two hits. Frilling hit a triple and a double and Clara Gephart and Holthaus each hit one double. Katelyn DeLoye stole two bases. Frilling earned the win in the circle. She pitched a complete game and had six strikeouts without walking anyone. Courtney Sutton was charged with the loss for Botkins. She pitched a complete game and allowed five earned runs. She had four strikeouts and one walk. Sutton was 2 for 2 at the plate and stole one base. The Jets blasted 19 hits against Jackson Center and earned a road SCAL victory in five innings on Monday. They had two errors while Jackson Center had three hits and no errors. Skylar Jones and Katie McKenzie were each 3 for 4 for Fairlawn. Jones had 2 RBIs and scored three runs while McKenzie batted in one run and scored two. Madison Pierce, Lauren Dudgeon, Renee Gent, Allison Roush, Ashley Roush and Alexia Graves each had two hits. Pierce hit home run while Gent, McKenzie and both Allison and Ashley Roush hit one double. Jones picked up the win in the circle. She pitched a complete game and had four strikeouts and three walks without allowing an earned run. Gabrielle Woolley was charged with the loss for Jackson Center. She pitched a complete game and had one strikeout and three walks. The Wildcats broke a 1-1 tie by scoring eight runs in the third inning on their way to a run-rule victory on Monday in Anna. Minster had 14 hits and three errors while Anna had seven hits and six errors. Taylor Homan was 4 for 5 with 5 RBIs for the Wildcats. She hit one home run, one triple and two doubles. Karly Richard and Danielle Barhorst each had two hits for Minster. Richard hit a home run while Barhorst and Alexis Bishop hit a double. Laney Hemmelgarn earned the win in the circle. She pitched four innings and gave up one earned run on two hits. She hit three strikeouts. Elaina Crosson was charged with the loss. She pitched three innings and allowed one earned runs in seven hits and three walks. Olivia Place and Taylor Spence each had two hits for Minster. Place hit a home run and Spence hit a double. The Cavaliers scored four runs in the seventh inning to close out a road Northwest Central Conference win on Monday. Lehman had 14 hits and two errors while Hardin Northern had seven hits and one error. Annie Stiver earned the win for Lehman. She had 15 strikeouts and five walks. Grace Monnin was 4 for 4. She hit three home runs and one double and had 7 RBIs. Angela Brunner was 5 for 5 with 4 RBIs while Abby Schutt was 4 for 4. Brunner hit home run and Schutt hit two doubles. New Bremen couldn’t overcome seven errors in a home nonconference game on Monday. The Cardinals had 14 hits while Celina had nine hits and two errors. Celina scored five runs in the first and two in the second and led the whole way. Molly Smith was charged with the loss. She pitched seven innings and allowed one earned run on nine hits and one walk. She had three strikeouts. Smith, Kira Bertke, Kelly Naylor, Hannah Tenkman and Taylor Paul each had two hits for New Bremen. Bertke hit a triple. Naylor led the squad with 3 RBIs. The Tigers rolled to a nonconference victory on Monday in Versailles. They had 12 hits and no errors while Tri-Village had five hits and no errors. Lauren Monnin earned the win for Versailles. She pitched a complete game and had one strikeout and one walk. Mackenzie Knore and Abby Stammen were both 3 for 3 for Versailles. Stammen had two doubles while Knore had one. Caitlin McEldowney, Elli Morris and Natalie Prenger each had one double. The Yellow Jackets earned a home nonconference victory against Lehman on Monday thanks to strong performances by singles players. Sidney won all singles matches. Prem Dev won 6-0, 6-0 at first singles. Grant Hoying won at second singles 6-0, 6-2 while Akansh Mani won 6-1, 6-0 at third singles. Jersain Brux and Broc Bey lost 6-3, 6-2 at first doubles while TJ Leonard and Kazuma Okada lost 6-2, 6-2 at second doubles.